While Egypt was the birthplace of Arab cinema, with its Golden Age spanning three decades in the 40s, 50s and 60s, the centres of film production in the Arab region spread in the 70s and 80s to Lebanon, Syria, Palestine, Algeria, Morocco, Tunisia as well as Egypt. In Egypt, increasing commercialisation and relatively low budgets were contributing factors to a relative decline in the quality of films in the 70s and 80s. However, there were some important exceptions to this, and Egypt remained the main exporter of films to the Arab region in that period. Arab films outside of Egypt were restricted to small audiences or national markets, but with many achieving critical acclaim and international recognition. Youssef Chahine continued to produce internationally acclaimed works, although now less identified with his Realist masterpieces, such as Cairo Station (1958) and The Blazing Sky (1954). He directed films in many other genres such as musicals and historical dramas of varying quality. He is credited with creating the first semi autobiographical films in the region during this period. The most outstanding of his autobiographical series is the first one, Alexandria Why? (1978), with its references to British rule in Egypt, and its homoeroticism. Chahine became one of the most internationally renowned Egyptian and Arab directors, winning a Lifetime Achievement Award at the Cannes International Film Festival in 1997. One of the reasons for Chahine’s international fame, above that of other distinguished Egyptian directors of the Golden Age of Egyptian cinema, could be his use of co-productions. His first co-production was with Algeria for the film The Sparrow (1974), followed by another joint Egyptian/Algerian production, Return of the Prodigal Son (1976). In the 1970s, Chahine established his own production company, Misr International Films, which gained access to alternative streams of income through the production of advertising and co-productions with European partners. By the mid-1980s, Chahine began producing his own films and those of other Egyptian directors as Franco-Egyptian co-productions. Some of the great Egyptian films made or released in the 70s include an excellent adaptation by Hussein Kamal of Naguib Mahfouz’s novel Gossip on the Nile (1971), with its depiction of members of the elite numbing themselves into oblivion by smoking hashish on a houseboat. During this period a film was produced which is considered by many as the finest art film of Egyptian cinema, The Mummy by Shadi Abd Al-Salam. It was made in 1969 when the cinema sector was still nationalised, but not shown in Egypt until 1975. The film is a powerful existential meditation on Egyptian identity structured around the historical discovery of Pharaonic treasure in Upper Egypt in the late 19th century. The Mummy has been recently restored and released to international festivals. The 70s and 80s witnessed the birth of New Realism in Egyptian cinema. Broadly speaking, Egyptian Realism portrayed the “bad guys” as old-moneyed land owners, and the films emphasised the evils of poverty. The change brought by New Realism in the 80s was mainly in its identification of new enemies -unscrupulous businessmen, the corrupt nouveaux riches, and uncontrolled materialism. The new heroes take the initiative, defend themselves, and are not afraid to use violence in the process. They are guardians of moral values that protect family structures and traditional social norms. The Bus Driver (1982) by Atef El-Tayeb is a typical example of New Realism. The roots of much Arab cinema outside Egypt lay in the use of the medium as part of resistance to colonialism. In Algeria, the provisional Algerian government residing in Tunis formed the Service de Cinema National in 1958. After the land reforms of 1971, a so-called New Cinema in Algeria began gradually to open up to subjects other than the war of liberation. By contrast to the studio-based and star led Egyptian cinema, Algerian cinema is mostly in outside settings and makes considerable use of non-professional actors. One of the most important Algerian filmmakers is veteran director Mohammdad Lakhdar Hamina. His film Chronicles of the Years of Fire won the Grand Prix at Cannes in 1975. The film is a beautifully shot epic tale chronicling, through the life of his lead character, the hardships suffered under French colonialism and the emerging resistance to occupation. Lakhdar Hamina’s previous film December (1972) is a moving and accomplished exploration of the psychology and moral dilemmas of a French army officer and an Algerian resistance leader, as the two embark on a battle of wills in an interrogation involving escalating levels of torture and murder. These two films are a genuine and moving exploration of issues fundamental to Algeria and France and whose international resonance remains live today, yet are surprisingly little explored. Lakhdar Hamina is a key figure in the development of Algerian cinema, and created a new international awareness of it. His influence can be felt on Algerian directors in the limelight today such as Rashid Bouchareb with his epic tales relating to Algerian liberation such as Days of Glory (2006) and Hors La Loie (2010). Like Algerian revolutionary cinema, Syrian cinema has also been political. In 1972, the Alternative Cinema in Syria articulated its orientations so to consciously oppose commercial Egyptian cinema. The Alternative Syrian Cinema movement included Palestinian and Lebanese film makers, as well as certain Egyptian directors such as Tawfik Saleh. He produced The Duped (1972) based on the realist novel Men Under the Sun by the Palestinian writer Ghassan Kanafani. Syrian director Mohammad Malas directed a very engaging documentary in 1982 called The Dream. At the basis of The Dream is a simple question asked by the director to residents of the Palestinian refugee camps of Sabra and Shatila in Beirut, just months before the massacre committed against them. The question is about what they dream of when they go to sleep at night. Old and young, men and women give fascinating answers, revealing dreams that only a Palestinian refugee would have. This documentary embodies Malas’ fascination with the sub-conscious, also manifest in Freudian themes to his feature films such as Dreams of the City (1985). Algerian and Syrian cinema in the 70s and 80s showed the influence of the Eastern block on the works of Mohammed Lakhdar Hamina who studied in Czechoslovakia, and most other leading Syrian directors such as Abdellatif Abdul-Hamid, Oussama Mohammad, Mohammad Malas, and Nabil Maleh who studied in Moscow or Prague. This makes their styles very distinctive among Arab films. Syrian film makers have proved to be staunchly independent, daring in their approaches, and socially and politically critical, while also being produced under the egis or in the shadow of the Syrian state. This is the case, for example, with Nabil Maleh’s film The Extras (1993), showing the crushing impact on a courting couple of living in a big brother state and society. The 1970s saw a shift away from official ideologies and political discourses, as can be seen in films such as Omar Gatlato (1976) and Adventures of a Hero (1976) by the Algerian Merzak Allouache, and Stars in Broad Daylight (1988) by the Syrian Usama Mohammad. The genre of Satirical Realism, with its ironic distortions, questions the realist representation and subverts its idealistic and propagandistic contents, particularly in relation to social liberation, progress, and modernity. 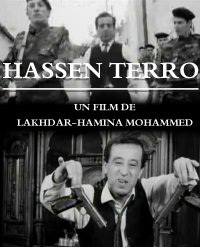 This includes the use of anti-heroes such as Hassan Terro, the reluctant resistance fighter in the film of the Algerian Mohammad Lakhdar Hammina. The theme of empty patriarchy (in the family, and at the levels of society and state politics) became prominent in films such as Wedding in Galilee (1989) by the Palestinian Michel Khleifi, and The Half-Meter Incident (1981) by the Syrian Samir Zikra. 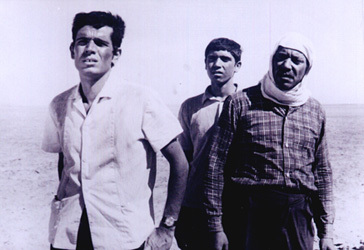 Tunisia produced its first feature film in 1967, and limited state financing was only conducive to producing one or two films per year through the 1970s and 1980s. In the early 1990s the state filmmaking institution was sold to the French pay television and production company Canal Horizons. The quantity of productions has not greatly increased since privatisation. In the 80s, two films by Nouri Bouzid were celebrated at the Cannes International Film Festival in their Un Certain Regard selection, Man of Ashes (1986) and Golden Horseshoes (1989). 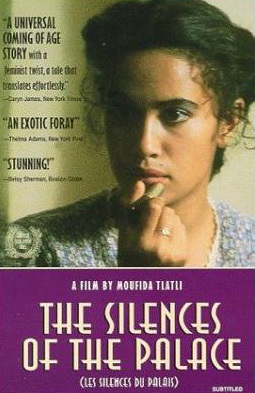 He later collaborated with other prominent Tunisian directors as writer on their scripts, notably with Ferid Boughedir on his acclaimed classic Halfaouine Child of the Terraces in 1990, and Mufida Tlatli on Silence of the Palaces (1994). In Morocco, the state has nurtured the filmmaking industry with the creation of a national cinema in the 1940s, and the state entering into co-productions, particularly since the 1980s. Auteur films seem encouraged as can be seen from the flow of films, with filmmakers having the opportunity to continue building on their successes. Notable Moroccan films produced during this period include A Door to the Sky by Farida Ben Lyazid (1989), and A Thousand and One Hands by Souheil Ben Baraka (1972). A Door to the Sky is the first North African film to address social and economic changes as experienced by a spiritual Muslim woman on a quest to preserve her cultural and religious identity. In it, Nadia, a young Moroccan emigre, returns from Paris to Fez to visit her dying father. At his funeral, she is overcome by the voice of Karina chanting the Koran. A powerful friendship develops between the two women and, inspired by their Muslim Sufi faith, they decide to turn the father’s palace into a women’s shelter. Lebanon was dominated by documentary filmmaking in the 70s and 80s, which coincided with a very long and destructive war between 1975 and 1990. The most prolific filmmakers capturing that period were Maroun Baghdadi and Borhane Alaouie. Baghdadi made some 16 films, but his best-known one from this period is Little Wars, shown at the 1982 Cannes Film Festival, and drawing acclaim for eschewing polemics for more personal, and hence more universal, issues. The 70s and 80s have witnessed the spread of the centres of production of film in the Arab region, and increasing individualism and diversity of approaches among filmmakers, away from any national or regional trends, each demarcating a style of their own. However, it should also be acknowledged that any grouping of directors under national, ideological, or sociological banners has to be read within the limited confines imposed by such interpretations, and does not by itself reflect the entirety of the creative or artistic approach of directors. The cinema of the 70s and 80s has lead to a creative resurgence in cinema from the Arab region and Diaspora in the 90s and 00s and increasing international recognition. Mona Deeley is founding director of Zenith Foundation and has responsibility for visual arts and online projects. As part of this, she has programmed and produced 4 editions of the Zenith London Arab Film Festival at BAFTA and the National Film Theatre in London, and is consultant programmer in relation to Arab films for other organisations. She has also headed the research and development of the Arab Cities exhibition project that resulted in the New Ends, Old Beginnings exhibition at the Bluecoat and Open Eye Gallery, and prior to that curated the Zenith symposium on modern and contemporary art from the Arab region.